The ayes may have it, but we, poor naysayers, remain in ignorance about the derivation of ay(e) “yes.” I hope to discuss the various forms of assent in December, and we’ll see that that the origin of some synonyms of ay(e) is also enigmatic. Perhaps the word does not even deserve the attention lavished on it by linguists, but, as usual in etymology and in much of scholarship, once a question is asked, there is no way to get rid of it. It draws more and more people into the controversy and gains momentum. The earliest known example of ay(e), at that time spelled as I, goes back to 1576. Shakespeare was born in 1564, which means that he heard aye ~ I most of his life; he used it freely in his plays. How and why did ay(e) come into existence in the second half of the sixteenth century? Guesses vary, with some conclusions looking more realistic than the others. I should propose that such a word, almost an interjection, originated “on the street” rather than in official parlance. Twenty-five years ago, Professor Rolf Bremmer wrote an article on aye and in passing compared aye and OK. The comparison seems apt. The origin of OK became clear after years of laborious research. Some people are still unconvinced by the results, but the statement one finds in the most recent dictionaries is probably all correct. The word gained fame (or notoriety) during an election campaign, spread from its home, and in the twentieth century, mainly after the Second World War, conquered half of the world. (As late as 1938, an Englishman, in a letter to The Spectator, vented his wrath on OK for “defiling” the English language and on those who dared say that it was “OK to walk in the Zoo on Sunday.” Ay(e) must have had a similar history: it probably rose from the lower depths, lost its slangy tinge, became conversational, and ended up among the most respectable, even if dead, words in the language, considering its use in voting (“all in favor say aye”—oyez, oyez, oyez). It is reasonable to suggest that by 1576 it had been around for a few decades. All eyes on the ayes. Let us now look at how some other scholars tried to deal with ay(e). Their approaches are partly predictable. Since ay(e) was spelled as I, it was natural to try to derive the word from the pronoun. Allegedly, people suddenly began saying “I, I” when they meant “yes, yes.” Objections to this hypothesis have been many. Mine is hidden in the adverb suddenly prefaced to began in the previous sentence. We will see that no one asked what had made the word popular around 1560, and this, I think, is the reason why the origin of aye remains unknown to this day. Then there is the adverb aye “ever,” and it occurred to some that ay(e) “yes” is the same word (after all, no goes back to the negation n- and Old Engl. a “ever”; the vowel was long, as, for example, in Modern Engl. spa or the family name Haas). Those who have been exposed to several varieties of English know that in many areas Kate, mate, and so forth sound as kite and mite. (So it is now in London, and I remember my futile attempts to explain to a secretary at Cambridge University that the first letter of my name—Anatoly—is an a. Unfortunately, she pronounced the town’s name as Kimebridge and could not make out what I wanted. I still have that ID for I. Liberman.) However short the path from A to I may be, I “yes” never meant “ever, always.” Yet even under the best of circumstances why should an obscure dialectal form of the affirmative take root in the capital and stay in the language? Even in the nineteenth century, Londoners did not say stition for station. At least two etymologists attempted to trace ay(e) to longer words or whole phrases. Both scholars have good credentials, but their conjectures strike me as less than totally persuasive (to use a polite euphemism), and I have to repeat the same fateful question: What caused the appearance of the enigmatic word in the sixteenth century? It may be worthwhile to reiterate a simple but constantly ignored rule of linguistic reconstruction. Whether we investigate the nature of a sound change, a shift in grammar, or the origin of a word, we have to discover the circumstances in which the process took place. If, let us say, short vowels became long in the thirteenth century, why just then? Certainly not because short vowels tend to strive for upward mobility. This lemur is called an aye-aye. An ideal yes-man and henchman. I may also add my traditional rueful comment. Before the recent publication of a bibliography of English etymology it was hard to find even the most important works on the history of any given word. In 1950 Gösta Langenfelt, in a Swedish journal (but he wrote the article in English! ), proposed the derivation of ay(e) from the group ah je. In 1954 E. K. C. Varty had a similar idea and put it forward in Notes and Queries. He was unaware of his predecessor. In 1956, Klaus J. Kohler developed Langenfelt’s idea (the most sensible etymology, as he called it). He published his findings in English and then incorporated his idea into a longer work in German. He never discovered Varty’s one-page note. Even the most conscientious etymologists are doomed to roaming in the gloaming. Despite the consensus on the matter in hand among three distinguished authors, none of whom addressed the question of chronology, I keep thinking that ay(e) did not develop from a compound or a word group. We will disregard the idea that ay is ya or ja, with the sounds in reverse order, or that it is a borrowing from Latin (so Samuel Johnson; his editor Todd questioned this hypothesis), but for the fun of it we may follow the path of Webster’s dictionary: first some vague references to Scandinavian and Celtic, then silence (no etymology in Webster-Mahn (! )), later “perhaps a modification of yea,” and the final splash: “Of uncertain etymology.” Being uncertain is an honest etymologist’s immutable fate. 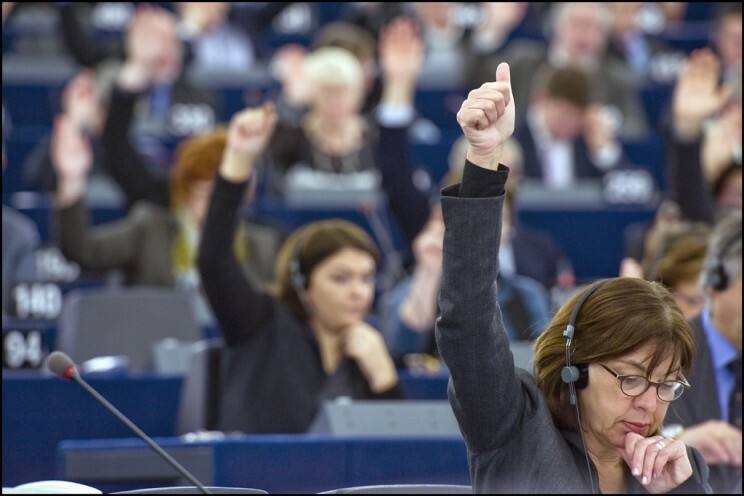 Image credit: (1) Parliament adopts EU budget for 2011. ©European Parliament/Pietro Naj-Oleari. CC BY-NC-ND 2.0 via European Parliament Flickr. (2) The Aye-Aye (from Trans. of Zool. Soc.). 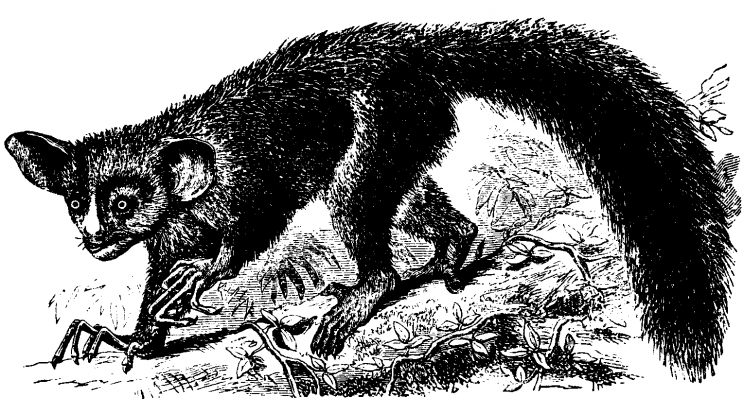 Illustration from “On The Genesis of Species” by St. George Mivart, F.R.S. (1827-1900.) London: Macmillan and Co. 1871. Project Gutenberg. Public domain via Wikimedia Commons. What is meant by ‘Unlock’ ? With regard to ‘the ayes have it ‘ ?